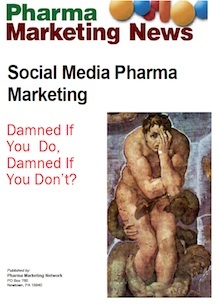 Social Media Pharma Marketing Damned If You Do, Damned If You Don’t? It is generally agreed that the return on investments (ROI) for traditional media like print and TV is declining. A new approach to the way forward in pharma marketing is needed and is actively being pursued by pharmaceutical marketers and their ad agencies. Is it time for the pharmaceutical industry to take the advice of some of its critics and use the new “social media” tools available to it and extricate itself from its moribund situation of declining ROI? These new tools — lumped under the heading “social networking” or “Web 2.0 — are big topics of discussion at many pharmaceutical marketing conferences. The question is, will pharma marketers embrace them, learn how to use them, and will they see benefits? Is your company ready to engage in social media marketing? If so, what’s your social media marketing strategy? By filling out the Pharma Marketing News Rate Your Social Media Marketing Readiness questionnaire, you will discover where you may need to augment your knowledge about social media and the hurdles you may need to overcome within your organization to implement a social media marketing program. When you complete the questionnaire, you’ll be able to see the average of all responses to date and get a better idea of how you and your company compare to that average. You then can return here to purchase the supplement. This collection of Pharma Marketing News articles, blog posts, and survey results provides you with an excellent introduction to the many issues involved in social media pharma marketing. 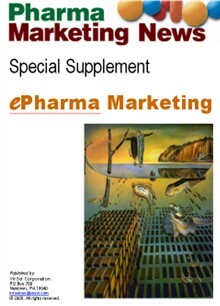 eMarketing is a challenge for the pharmaceutical industry. It is widely known that the percent of the pharmaceutical marketing budget spent in the “e” space has remained below 5% since the dawn of the commercial Internet! Many experts, however, believe that pharma eMarketing is at a tipping point and that pharmaceutical companies are poised to shift substantial ad spending from TV and other media to the Internet. The selection of articles in this Special Supplement to Pharma Marketing News was chosen to give you a better perspective on pharma eMarketing. Included are real world case studies that illustrate the advantages of eMarketing such as depth of information, interaction, relationship building and superior customer engagement. This article presents key takeaways from the FDA hearing, a synopsis of the presentations made by John Mack, Publisher, Pharma Marketing News, at the hearing, a review of Ignite Health’s study regarding effectiveness of sponsored links, and the next steps in the process of issuing guidance. The debate surrounding the strategic and economic value of having an online DTC strategy rings loud and clear at most global pharmaceutical companies today. In general, the key questions are where and how the online strategy creates disproportionate and sustainable value for the brand. This article focuses on the power of the product Web site as a conversion tool and illustrates how the Web strategy fits into the overall marketing continuum – from initial engagement all the way to loyalty marketing. A substantial portion of drug industry comments submitted to the FDA was devoted to how pharmaceutical companies should be held accountable for a communication about its product(s) and how much control they exert over activities on the Internet and social media. Internet advertising revenue in the United States totaled $26.0 billion for the full year of 2010. How much of this was spent by pharma? Best guesstimate: $1 billion, which accounts for about 11% of the total pharma physician and consumer ad spend. This article includes data and charts showing trends. Adherence: Do We Really Need an App for That? Lots of patients — even patients taking life-saving medication — are not as “adherent” as they should be, which means that the treatment does not work as advertised and drug companies lose money. There have been many attempts by the drug industry to improve medication adherence, but it has been a tough challenge. The industry, however, has not given up. The new battleground for combating non-adherence is the mobile smartphone and the smartphone app is the weapon of choice. Are the benefits worth the risk? This article focuses on Adobe Connect for eDetailing, a specific collaboration between Adobe and ConnectSolutions, a leading provider of private cloud deployments of web conferencing and collaboration solutions. Preeti Pinto, M.S., Senior Director Promotional Regulatory Affairs, AstraZeneca, provides insight on the regulatory actions taken by the FDA with respect to online DTC marketing by pharmaceutical companies. She summarizes the most commonly cited violations found on pharmaceutical company web pages. Are Pharma Bloggers Biased Against the Industry? How supportive or critical are individual blogs in the pharma blogosphere and is there an overall bias one way or the other? Despite dire predictions of ‘PR failure,’ the #rxsave Twitter chat hosted by @AstraZenecaUS on 15 February 2011 was a great success, which is pharma social media speak for ‘did not crash and burn.’ It was proof that a pharmaceutical company can indeed host meaningful Twitter chats. This article reports the results of an informal Weber Shandwick survey regarding social media guidelines recently published by the British pharmaceutical industry regulators. It includes advice for how to innovate online without waiting for more specific guidelines from regulators. Once again the Brits have beaten the US in issuing useful guidelines for social media use by the pharmaceutical industry! As I reported back in April, 2011, the Prescription Medicines Code of Practice Authority (PMCPA), which oversees the self-regulatory code of the Association of the British Pharmaceutical Industry (ABPI), published “informal guidance” providing the drug industry advice on how to use online communications. Prescription Medicines Code of Practice Authority Issues Social Media Guidance for Pharma. The Brits have won the race to issue social media guidance for the drug industry! In April, 2011, the Prescription Medicines Code of Practice Authority (PMCPA), which oversees the self-regulatory code of the Association of the British Pharmaceutical Industry (ABPI), published ‘informal guidance’ providing the drug industry advice on how to use online communications. There are thousands of health Web sites on the Internet. Accreditation is not an appropriate path for all these sites to take, but for those sites that can afford it and that meet rigorous standards for quality and accountability, accreditation can help distinguish them from their competitors and increase consumer trust. Pharmaceutical sites focusing on consumers, in particular, stand to benefit. Can Health Web Sites Improve Compliance? For various reasons, it is hard to find a conclusively documented answer to a seemingly simple question: do interactive health education media improve patients’ health practices? In fact, a recent high-profile report attempted to answer that question and got it wrong: procedural flaws led them to an unjustified conclusion. The problem lies in seeking a broad general picture. More appropriate is to focus on the specific patient population, the distinct behaviors to be changed, and the particular tactics employed. Steve Smith, Editor-in-Chief of Medsite has reengineered his company’s eDetailing line to create engaging interactions crafted around effective methods to engage, inform, and educate adults. Now he has tapped this experience to design the company’s first Consumer Detailing (“cDetailing”) product, which is a novel rich-media online consumer disease education and drug information program. A conversation with Joseph Kim, MD, MPH, VP of Medical Affairs and Technology at Medical Communications Media, Inc., about the rapid development of mobile medical applications and the legal and regulatory issues that physicians, patients, and pharma developers/sponsors should be aware of. A conversation with Monique Levy, VP Research at Manhattan Research, about the changing pharma eDetailing landscape. Ms. Levy discusses how the online pharma promotion landscape has changed, and which types of programs garner the largest audience as well as how the rep relationship is evolving and the role of new technologies such as tablets. Pharmaceutical companies are under increasing pressure to reduce costs, speed the time-to-market for new products and ensure that physicians are informed and educated about their products. MERGE Rx recognizes this need and offers a new generation of Web-enabled software that helps pharmaceutical companies manage physician interactions — including key opinion leader (KOL) management, phaseIV trials, and eDetailing — from a single, secure and scalable access point. Let’s look ‘under the hoods’ of two pharma-sponsored mobile apps and compare disclaimers. We’ll compare Janssen’s PASI calculator, which has an update disclaimer, with the new AFib Educator 2.0 app developed by Sanofi-Aventis. Allergan, Eli Lilly, Johnson and Johnson, Novartis, Pfizer, Novo, and Sanofi-Aventis filed a ‘citizen petition’ with the FDA, urging the agency to ‘establish comprehensive, clear and binding regulations to guide the industry’ in communicating off-label drug information to physicians and payers. Although the words ‘Internet’ and ‘Social Media’ are not mentioned in the petition, it is likely to hold up social media guidelines regarding ‘unsolicited requests’ that were promised as the first in a series of FDA guidelines. This article is a review of an industry conference presentation that focused focused on leveraging eDetailing for effective closed-loop marketing campaigns. MedTera recently partnered with HealthPrize Technologies, a web-based software company that motivates people to fill and stay on prescription medications, to bring together MedTera’s online and offline educational resources and HealthPrize’s online, interactive platform to educate people about their chronic diseases and incentivize them for taking their medications as prescribed. To answer the many questions raised by this collaboration — including concerns about off-label communications — Pharma Marketing News invited Daniel Palestrant, M.D., founder and CEO of Sermo, to be a guest on a recent Pharma Marketing Talk podcast. This article is based partly on that interview as well as other sources. P&G Discovers It’s “Free” to Advertise on Facebook! Is Pharma Next? A ‘recession’ in pharma marketing is likely considering the well-known ‘patent cliff’ that’s currently in progress; ie, blockbuster drugs with a combined $170 billion in annual sales will go off-patent by 2015. That means even less mass media advertising and more digital advertising. But ‘more digital advertising’ does not mean that much more money will be spent in the digital arena. That’s because of social media, where it’s virtually free to advertise! Tips for Surviving the Slump! This article presents opinions and evidence that there is a slump in pharma marketing spending and provides some tips to vendors and ad agencies to help them the slump. eDetailing in one form or another seems to be making a comeback since the recession hit the drug industry in 2007 and 2008. Which is the “chicken” and which is the “egg”? Did the uptick in adoption of eDetailing technology lead to the recent layoff of pharma reps or were reps laid off because of the economy and subsequently replaced by machines? Consumer Use of the Internet for Health: Whose Numbers Do You Believe? This article includes DATA and an analysis of methodologies of various online consumer market research studies to help you understand how to apply these data to your online marketing campaigns. Whether or not it is “beneficial” for pharma company employees to edit Wikipedia information about their own company’s products is difficult to know for certain. This article summarizes the pros and cons of pharmaceutical companies editing Wikipedia articles to correct “misinformation” about their drugs. If pharma marketers wish to tap into closed online patient communities that are rich sources of information, they need to pay careful attention to the rules lest they suffer the consequences to their reputations. What Are Your Social Media Principles? Peter Pitts, author of DrugWonks Blog, has put together 11 “principles that must serve as the basic substrate of regulated social media participation. This article takes a closer, critical look at “Pitts’ Principles” and discusses how successful the pharma industry has been at following these principles to date. According to a Jupiter survey, consumers don’t manage their health online because they have low confidence in their ability to use online health resources to improve their health. Pharmaceutical marketers must leverage health beliefs and models to design comparatively more effective adherence-related online marketing programs. Solving Pharma’s Social Media Problems — Mission Possible? A conversation with Mark Bard, founder of the Digital Health Coalition, regarding the mission of the Coalition and what companies and individuals are involved. While primary care physicians in general are frequent users of the Internet, oncologists see online sources of information as more important than PCPs and therefore may need less personal contact to learn about products. That was just one of the results from the 2011 Digital Life survey of 1,454 physicians summarized is this article. Is Your Brand a Digital Genius or a Feeble-Minded Idiot? When it comes to digital IQ, some brands are geniuses and some are feeble-minded idiots, according to the “L2 Digital IQ Index” for pharmaceutical brands, a first-of-its kind measurement of the digital competence of 51 pharma brands across eight therapeutic categories. Digital Pharma Is Alive and Well in Europe! These highlights from the 2010 DigiPharm EU conference summarizes presentations made by marketing specialists from Lundbeck, Janssen, GSK, Schering Plough, Boehringer Ingelheim, Pfizer, Genzyme and Merck Serono. It’s a summary of the best current practices and a glimpse at how EU pharma companies are driving digital marketing and communications forward. Do Drug Copay Coupons Drive Up Healthcare Costs? Coupons for drug co-payments are illegal and drive up long-term health-care costs for all, a consumer group and four trade-union health-insurance plans said in announcing lawsuits against eight pharmaceutical companies. The lawsuits claim that although coupons reduce the consumer’s out-of-pocket cost, the health insurer still pays the previously negotiated price to the drug company. With no savings from generics, health plans will need to charge patients more to keep up with rising costs, the lawsuits say. Most pharmaceutical firms have piloted eDetailing programs and scaled them successfully. However, although Traditional eDetailing has been around for at least 5 years, marketers must expand the definition of eDetailing. To this end Croom offers a Best Practice Guide for eDetailing to help pharma marketers optimize the reach and impact of eDetailing. eDetailing proponents, inside pharma companies and outside, use survey data to justify their arguments for greater spending on eDetails. In some cases, however, the numbers seem to show confusing trends and even may suggest that eDetailing may not be all that it’s cracked up to be. To make sense of current estimates about pharma spending online and understand where it may be heading in the future, Pharma Marketing News recently hosted a Pharma Marketing Roundtable discussion of the issues. This article summarizes that discussion. Several recent surveys indicate that pharmaceutical companies will spend more money on e-mail marketing to consumers in 2005 (see “DTC in 2005: Can You Teach Old Dogs New Tricks?“). Perhaps they should also spend some money and time to ensure that their e-mail campaigns adhere to emerging best practices with regard to privacy, HIPAA, SPAM, and permission-based marketing. Pharmaceutical marketing strategies are evolving more rapidly than any other time in history. The traditional detail-based marketing model is being challenged by physicians’ ever-growing time pressures and lack of time for sales reps. Given these challenges, most pharmaceutical companies are committing some level of marketing resources to e-promotion, including e-detailing and e-CME initiatives. This article reviews e-prescribing offerings of vendors like Allscripts Healthcare Solutions and ScriptRx, Inc.
ePrescribing: What Role Should Pharma Play? A panel entitled What Role Should Pharma Play in ePrescribing and the Point-of-Care? at a recent ePharma Summit conference held in Philadelphia, PA, discussed the issues facing pharmaceutical companies as electronic prescribing (ePrescribing or eRx) threatens to upset the “balance of power” between physicians, pharma companies, and payers at the point-of-care. 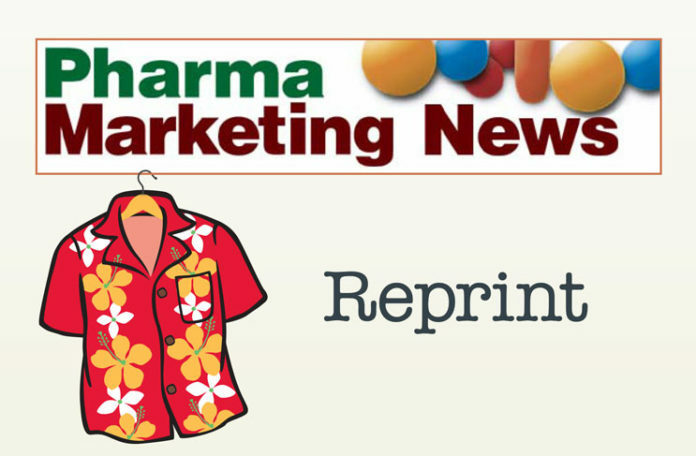 This article describes and summarizes the features and benefits of the Reprints Desk’s ePrints NRx solution — a new scientific article collection service that simplifies the re-use of PDFs by medical marketers, brand managers, and sales professionals. As US pharmaceutical companies search for best practices to battle patient drop-off, their European counterparts have overcome Byzantine regulations and reduced margins to implement strikingly effective compliance programs directly to consumers. The pharmaceutical industry is struggling to develop an eMarketing strategy in Europe, which is comprised of many relatively small markets (the member countries of the EU) having significant cultural and language differences. This article presents selected results from a survey of pharmaceutical experts on eDetailing and Online Marketing conducted in 2005 by eyeforpharma, MediQuality, and PharmiWeb Solutions. In the last year the FTC has issued regulations that set forth additional requirements under the federal CAN-SPAM act that you should be aware of. Hilary M. Wandall, Esq., CIPP, Director, Corporate Legal/Merck Privacy Office, Merck & Co., Inc., summarized these regulations in a recent ePharma Summit presentation in Atlantic City, NJ. In this review of presentations made at the the PharmaMarketing Summit 2012, the common thread throughout is the evolving nature of the pharma-physician relationship, which is being transformed by the power of patients and payers, particularly aided and abetted by new emerging technologies. This article summarizes results of the ‘Technology Impact on Healthcare’ online survey. This article summarizes the survey results. The survey asked respondents to rate the importance internet tools and services in improving healthcare today and five years from now. Respondents also were asked to evaluate the impact of new technologies on public health problems such as obesity, vaccination, and smoking and which areas of the world are most active in developing and using health-related social media, mobile apps, and online communities. Finally, respondents were asked to identify which stakeholders — government, technology companies, health-care professionals, patients, payors — will be the major players online in 5 years. This article provides details about the HealthPrize’s innovative, compelling approach to solving one of pharma’s most perplexing puzzle: how to improve medication adherence. Included is a summary of a Pharma Marketing Talk podcast interview of Tom Kottler, CEO, and Katrina S. Firlik, M.D., Chief Medical Officer, HealthPrize. There is a broad spectrum of online promotional and educational opportunities that pharmaceutical companies have at their disposal to interact with, inform, and influence physicians. Lathian Systems, a provider of online marketing and sales solutions, offers these and more in its Spectrum of Solutions for life science companies. n the future, will the FDA also be pulled into social media by a major Rx drug recall? What can the drug industry learn from the FDA’s use of social media and will FDA’s example help guide the industry toward best practices in this area? This article describes FDA’s social networking initiatives in context of these questions. FDA’s revised draft guidance calendar for year 2011 is missing ‘Promotion of Prescription Drug Products Using Social Media Tools,” which WAS on the 2010 Agenda. Included, however, is ‘Responding to Unsolicited Requests for Prescription Drug and Medical Device Information, Including Those Encountered on the Internet.’ FDA says this includes Internet requests. Why did the FDA put this issue at the TOP of its list of ‘issues related to Internet/social media promotion of FDA-regulated medical products’ for which it promised guidance? Where did that issue arise? It wasn’t mentioned in the Federal Register regarding social media guidance. The Social Media Guidelines Nobody Expected! Two days after Christmas, on December 27, 2011, while most of us were still on vacation, the FDA quietly issued “Guidance for Industry Responding to Unsolicited Requests for Off-Label Information About Prescription Drugs and Medical Devices.” Section VI. of this guidance addresses responding to unsolicited requests on public forums such as the Internet. This article takes a closer look at how the off-label guidelines apply to social media such as Youtube, Blogs, and Twitter. This article reviews the FDA’s guidance on how pharmaceutical companies can respond to misinformation related to a firm’s own FDA-approved or -cleared products when that information is created or disseminated by independent third parties on the Internet or through social media, regardless of whether that misinformation appears on a firm’s own forum or an independent third-party forum or website. On January 14, 2014, the FDA published “Guidance for Industry Fulfilling Regulatory Requirements for Postmarketing Submissions of Interactive Promotional Media for Prescription Human and Animal Drugs and Biologics” in the Federal Register (Docket No. FDA-2013-N-1430). Are There Any Useful Detours or Workarounds? This article reviews the FDA’s guidance on how pharma marketers must present both benefit and risk information within a “promotion” of FDA-regulated medical products via electronic/digital platforms that are associated with character space limitations: i.e., specifically through social media such as Twitter and through online paid search (e.g., “sponsored links” on search engines such as Google and Yahoo). The review also includes some ideas on how pharma marketers may be able to use Twitter for branded Rx messages and still be compliant with the new FDA guidelines. Drugmakers dissatisfied with the FDA’s use of guidances as a form of policymaking — including long-awaited guidance for use of social media by the pharmaceutical industry — could find legal ammunition against the practice. This article presents the relevant case information. This article reviews two recently published and important guidances from the FDA that concern the dissemination of drug information to consumers. Pfizer’s US corporate Facebook page was “hacked” by some ‘Kiddies.’ What should the industry learn from this experience? This article reviews a presentation made by David Ormesher, CEO of closerlook, inc. at the recent CBI eDetailing Conference in which he said, The future of eDetailing is physician relationship management. The benefits of creating long-term relationships include brand loyalty, detailed customer intelligence and sales integration with the field force. Some biased observers (ie, consultants who currently work for Pfizer or may wish to work for Pfizer in the future) are reluctant to blame Pfizer and tend to shift the blame to Facebook. However, others believe Pfizer is to blame, not Facebook. As the hackers themselves said, it was easy for them to guess Pfizer’s Facebook password. What are the lessons should Pfizer and other pharma companies learn from this? There’s a lot of brouhaha these days in pharma circles about ‘gamification’ as if it were the newest thing since sliced bread. These days, however, it may be easier for a pharma company to create a real-life museum educational gaming experience than a virtual world game on Facebook. Way back in 1984, gamification was much simpler. A Search Ad Format That Has All FDA Could Want… But Pharma Can’t Use It! Data suggest that Google’s OneBox NIH Rx ads effectively reduce organic search visitation driven to pharma sites pushing the traffic to NIH content instead. Is it logical to conclude that Google stands to gain paid ad revenue when pharma marketers have to compete with OneBox ads by buying more paid search placements to make up for the loss of organic search visits? While advergaming seems to work for the consumer package goods industry, will it also work for pharmaceuticals? Not Medical Advice; Also Not Educational! It May Fly in Battlecreek, But Not in Raritan! Pharmaceutical marketers are continually challenged by their superiors to quantitatively measure the return on investment (ROI) of their campaigns. This is especially true for their eMarketing initiatives. So, how do you know which online tactics are giving you the best return on your investment? To get started it is helpful to compare and contrast your own online strategy’s performance against competitive and perceived “best-of-class” tactics to evaluate the effectiveness of online programs, emulate effective strategies, and establish best practices. In other words, you need some eMarketing benchmarks. This article summarizes a Pharma Marketing Talk conversation with Carolina Petrini, SVP, Marketing Solutions, comScore, regarding her company’s consumer e-marketing effectiveness benchmarks for the pharmaceutical industry. Should pharmaceutical companies appoint employees as Wikipedia ‘spokespeople’ to perform all edits to Wikipedia articles on behalf of the company? How Readable, Credible & Useful are Pharma Blogs? This article presents the compllete results from the first ever survey of The Pharma Blogosphere in which blog readers evaluate 22 different pharma-related blogs on the basis of readability, credibility, usefulness, and bias. This article reviews BI’s “playbook” — titled “How pharma TweetChats can drive healthcare innovation” — which provides detailed insights for planning and delivering successful pharma TweetChats. The authors of the playbook — Patricia Alves, Social Media Community Manager, and Jaclyn Fonteyne, Social Media Specialist, at BI — were also interviewed for this article. How Should Pharma Engage in Social Networks? Each pharmaceutical company should have its own guidelines for best practices in the social media space. To assist in that discussion, Pharma Marketing News hosted a survey to explores issue relating to pharma advertising and engagement in social networks. This article summarizes the results of that survey. This article presents a summary of a conversation with Jenna Woodul, LiveWorld’s EVP and Chief Community Officer, about how pharma companies can manage their social media interactions using technology and credentialed participants. Is It a Game-Changer for Consumer & Physician Access? This article summarizes how the iPad is currently being used by the pharmaceutical industry, how it is being adopted by physicians, and what the roadblocks are to using it for eDetailing. iPad – What’s It Good For? Is It Just Another Tablet Device? Does No Flash Mean No eDetailing? Is Pharma Blocking or Supporting iPad Use by Sales Reps? The Impact of eDetailing: Will it Complement, Replace, or Become Integrated with the Sales Force? The number of pharmaceutical sales representatives has increased sharply in recent years. More than 90,000 representatives compete for the attention of 650,000 practicing physicians, only 125,000 of whom are top-tier prescribers. Some people, maybe physicians most of all, hope that online detailing (eDetailing) will reduce the number of office visits from all these pharmaceutical sales representatives chasing after the same docs. This article reviews a presentation on this provocative topic made by David Hauben, Director of eBusiness at Aventis Pharmaceuticals. A discussion with Jonathan Richman, Group Director, Insights and Planning at Possible Worldwide about Facebook’s changes to its commenting policies and his recommendations for pharma marketers who wish to develop Facebook pages. This article presents an overview of the types of organizations that submitted comments versus those that made presentations at the November 2009 public hearing. It also includes general comments from the pharma industry regarding the process by which the FDA should regulate the Internet and social media. Also presented in this article are the comments submitted by consumer advocates and individuals who generally supported more strict regulation across the board. Many pharmaceutical companies are currently absorbing their e-business units and personnel back into the brand teams. This may be a glass is half-empty versus half-full situation. Someone who looks upon the glass as half-full is Bruce W. Bunyan, Senior Director & General Manager at Aventis Behring, the therapeutic proteins business of Aventis. This article includes a case study based on Bunyan’s experience on how Aventis Behring brought together the online and offline marketing mix within his company. He frankly discussed the obstacles he faced and claimed “he learns more from his mistakes than from his successes.” It is obvious, however, that Aventis Behring is on the right track in overcoming the challenges. New online strategies have made eSampling a tool for significantly expanding targeted physician and sample coverage. Applications include accelerating new product uptake, efficiently maintaining physician coverage for mature brands, covering hard to reach physicians and driving patient demand. Despite the fact that physician usage of the Internet has increased over the past few years, solid evidence for the reasons they access the Internet or, more importantly, if the knowledge they gained from online CME presentations has any impact on their practice is still largely unknown. The Apple iPad has also become a “must have” for pharmaceutical sales reps, but how are physicians and their patients using the iPad within the clinical setting? That was the focus of a study done by a team consisting of healthcare professionals in an NYU Langone Medical Center department, led by Douglas Elwood, MD, MBA, who is currently Director, GMI Strategy and Innovation at Bristol-Myers Squibb. This article reviews the latest results of that study. Is There a Cure for Mediocre Pharma Mobile Apps? Listen Up, New Marketing Grads! Mobile is the new ‘shiny thing’ of interest to pharmaceutical marketers. However, most pharma mobile apps that I have seen are pretty mundane as far as marketing/advertising is concerned. What’s it going to take to make these apps more interesting and useful? On Monday, September 21, 2009, the FDA published a notice in the Federal Register calling for a public hearing on the Promotion of Food and Drug Administration-Regulated Medical Products Using the Internet and Social Media Tools. The FDA is requesting the public to submit comments to a series of specific questions, which are included in a new survey created by Pharma Marketing Network/News. Let’s use this survey to help educate the FDA on the issues. One example of how pharma companies can use infographics to educate their stakeholders is the Epilepsy Foundation/Lundbeck nationwide initiative to bring information about managing seizures to people living with epilepsy and their families. This article discusses how Centric Infographics worked with the Foundation to create the infographic system at the center of this successful campaign. At a recent Pharma Marketing Talk podcast, John Mack spoke with Mark DePaoli, life sciences analyst at BrandIntel, an online information service, about mining CGC to evaluate consumer sentiment about pharmaceuticals. This article summarizes that discussion and presents a case study analysis comparing consumer sentiment of Botox vs. Restalyne. This article is a review of a presentation by Aaron Uydess, Senior eMarketing Manager at Novo Nordisk, made at Eye for Pharma’s 3rd eCommunication and Online Marketing Summit held October 23-24, 2008, in Boston, Massachusetts. Uydess presents a best-in-class approach to developing online plans that align with strategy, reduce silos, and measure and merchandise digital strategies across a pharmaceutical marketing organization. Medical device marketing is different than Rx drug marketing, which is something attendees of the recent PharmaMed Marketing & Media Conference hosted by Med Ad News learned. This article summarizes a presentation from that conference and discusses how medical device marketing to consumers and physicians is different than Rx drug marketing. While some device marketing campaigns take a page from the Rx arena, there are difficulties and roadblocks ahead and these are also summarized in this article. Merck to Slash Field Force? On the Internet it’s still about content, content, content. Some may consider this old-fashioned. But Siren Interactive, a midwestern interactive eMarketing firm, believes that valuable Internet content is a prime component to an effective eMarketing strategy for pharmaceutical companies. A conversation with Jacqueline Thong, co-founder and CEO of Ubiqi Health, about disease management mobile applications and how pharma marketers can leverage mobile health apps to engage with and learn from patients. In a blog post provocatively titled ‘An App for That, But For How Much Longer?’, PhRMA’s Kate Connors agreed with a Washington Times op-ed piece that suggested the FDA will soon require apps such as medication prescription renewal reminders and blood glucose level tracking functions to be regulated as medical devices. The op-ed author, Joel White, executive director of the Health IT Now Coalition, suggests that this effort would lead to increased costs as well as constraints on user access to these apps, which ‘may cause developers to move on to other, less burdensome endeavors.’ ‘In the end, this could hinder the way that patients can actively improve their own care,’ said Conners. Is this fear warranted? Are there apps that SHOULD be regulated by the FDA? Read this article and find out. Pre, Post, or No Moderation… Whatever. You Must Have a Plan! This article presents a summary of results from a recent survey of readers and other experts regarding pharma social media moderation best practices. Multichannel pharma marketing is conceptually relatively simple to understand, but incredibly difficult in practice, says Len Starnes, former Head of Digital Marketing & Sales, General Medicine at Bayer Schering Pharma. That said, multichannel is not a transient phenomenon, it’s here to stay. Starnes hosted a survey on LinkedIn to answer the question: When will pharma marketing become de facto multichannel marketing in future? The distribution of medical reprints to healthcare professionals (HCPs) by sales reps is not only a logistical problem but a channel problem as well. Reprints Desk helps pharmaceutical companies to deploy copyrighted e-prints and other marketing materials via iPads and other tablets, or via their own apps and websites in a controlled manner as part of a multichannel marketing campaign. Recently, online privacy issues have been in the news as Congress exams whether it should enact legislation requiring a do-not-track function in Web browsers to allow consumers to opt out of the extensive data collection by Internet companies. This article is a summary of A Center for Digital Democracy complaint filed with the FTC and a review of the issues. The article also includes a compilation of more than two dozen ‘innovative” online marketing products/solutions mentioned in the complaint. The pharmaceutical industry must find ways to utilize the new media tools that other industries use while ensuring compliance with FDA regulations. The good news is we can! The author summaries the content of the book and offers practical guidelines for the pharma marketers. Envision Solutions and TNS Media Intelligence/Cymfony teamed up to write a white paper, which summarized a new social media monitoring and marketing regulatory framework for pharmaceutical companies. This article takes a critical look at the Framework and offers further insights into the regulatory issues it raises. Online CME – A Glass Half-Full or Half-Empty? This article looks at data regarding online CME – number of physicians doing CME online, etc. It also includes a case study of a popular pharma-sponsored online CME program, which highlights the necessary ingredients for success. Short summaries from the Pharmaceutical Marketing Global Summit provides information about how pharma marketing practices need to evolve. This article presents a summary of comments to FDA from the drug industry addressing regulatory concerns when using social media tools associated with space limitations or tools that allow for real-time communications to present product information. Paid Inclusion: Too Hot for Pharma Marketing? The significance of search marketing in the overall pharmaceutical marketing mix cannot be overstated. Search is one of the fastest-growing categories of online advertising and pharmaceutical marketers need to have a good search strategy. The question is, should paid inclusion be part of that strategy? This article summarizes the issue of paid inclusion and presents results of the recent online Pharma Search Engine Marketing Survey, which was conducted by Pharma Marketing News between March 2, 2006 and March 25, 2006. Can Paid Inclusion be Misleading? Return on DTC investment is decreasing and in the post-Vioxx marketing environment in which pharma marketers find themselves, there is a call for less advertising and more education. There are several new strategies and solutions available to pharmaceutical marketers that are designed to increase the education quotient of pharma marketing communications. One such solution is wireless Webpad developed by Phreesia for deployment in doctors’ offices. Personalized e-Marketing – How can you create and profit from a customer’s lifetime experience? Instead of talking about CRM (Customer Relationship Management), Philippe Barzin, former Director of Connectivity at Johnson & Johnson, focused on HRM or “Healthcare Relationship Management.” While CRM focuses on a single customer at any one point in time, HRM focuses on supporting the customer across multiple channels – Web, email, call center, field visits – and over a lifetime. Considering the physician customer first, Barzin cited research showing that physicians value many sources of contact with pharma companies and actually find online sources less valuable than offline! To demonstrate the effectiveness of “customer-oriented surround marketing” and personalization, Barzin used BabyCenter, a J&J consumer-focused web site, as a case study. Has It Been Found? What Does It Reveal About Pfizer’s Social Media Implementation Plan? Ray Kerins (@raykerins), Vice President of Worldwide Communications at Pfizer, talks about Pfizer’s ‘groundbreaking internal Social Media Playbook’ but won’t show it to us. What can be in the playbook? How many people does Pfizer dedicate to social media? This article discusses those questions and offers a peek into a playbook contender. Sales Reps Have 48 Hours to Beat It or Join It! Pfizer has become the latest drug company to offer doctors the option of using the Internet to order free samples of its drugs, a trend illustrating the diminished role of sales representatives, whose ranks continue to decrease. The service is called SamplesDirect. Was It a “Bad Ad” or Just a Bad Idea? On May 22, 2012, Pfizer and Eating Well Media Group, publisher of Eating Well magazine, announced the launch of Pfizer’s Lipitor For You “Recipes 2 Go” mobile application, marking the first time Pfizer has released a consumer mobile app for a prescription product in the U.S. Was It a ‘Bad Ad’ or Just a Bad Idea? Despite Pfizer’s heroic and unprecedented effort to maintain Lipitor’s market share after expiry last November and after spending more than $87 million promoting the medicine, the world’s biggest drug company is quietly giving up on its once-great cash cow for good because more generic versions will soon be going on sale. Meanwhile, AstraZeneca promoted Crestor on its corporate blog. It’s unusual for a pharmaceutical company to mention a product by brand name on its corporate blog. It’s even more unusual to mention BOTH the product AND its indication — because that would be promotion regulated by the FDA. But AstraZeneca has done just that on its ‘AZ Health Connections’ corporate blog. Why now? Can it be a purely opportunistic cheap shot? Were Guidelines Held Hostage as Part if FDA’s and DOJ’s Criminal Investigation of Google? Were FDA’s infamous 14 warning letters to pharma a ploy to force Google into a $500M DOJ settlement regarding illegal online pharmacy ads? In addition, could FDA have been holding back issuing pharma social media guidelines — which would include guidelines for displayig compliant information in space-limited applications such as Twitter AND Google Adwords — until Google settled its case with the DOJ? John Mack, a.k.a. pharmaguy on Twitter, answers questions about his background and provides his opinions on how pharmaceutical companies will use social media in the future. This article focuses in some detail on three interesting pharma social media initiatives: (1) Procter & Gamble’s Asacol Community for Ulcerative Colitis Patients; (2) Novo Nordisk’s Levemir-branded Race With Insulin Twitter account; and (3) UCB’s sponsored epilepsy community on the PatientsLikeMe website. One of these is a good example of how pharma marketers can leverage social media, one is bad, and the other is just plain ugly! In baseball, one hit out of three at-bats isn’t bad, but for marriages and social pharmaceutical marketing it’s not that good. Pharmaguy’s Twitter Followers: What Do They Want and How Is It Relevant to You? Pharmaguy (aka John Mack) now has over 4,900 (as of November, 2009) followers and these followers are probably the same followers you’d like to have if and when you get involved in Twitter. But hurry! Breaking in as a power user may be difficult. Research shows a virtuous cycle may exist, making popular users ever more popular. This article summarizes the findings of a survey of over 400 of @pharmaguy’s followers. The results will give you a better idea why people interested in the pharmaceutical industry use Twitter and what they expect to get out of it. This article includes insights on content marketing from pharma experts including Thibaud Guymard, Digital Marketing Manager at MSD France. Guymard has broad experience with pharma content marketing, including roles as co-creator of the Digital Health Think Tank and as an Advertising Manager at Saatchi & Saatchi Health. Guymard also assisted in developing the Pharma Content Marketing Webinar organized by Kakushin Webinars. An Interview with eMarketer Senior Analyst Lisa Phillips. To better understand these numbers and other information presented in the eMarketer report, PMN interviewed Lisa Phillips, eMarketer Senior Analyst and author of the report. According to the latest Cegedim Strategic Data (CSD) Audit, the 20 pharma companies that spent the most on total promotion — which includes traditional professional detailing, eDetailing, Direct-to-Consumer (DTC) advertising, professional meetings, and journal advertising — spent a total of $14,784 Bn in 2013. How representative is this of the entire industry? It’s difficult to say. According to CSD, the Top 20 pharma companies spent $10.1 Bn on professional detailing in 2013, which is about 70% of the $14.9 Bn CSD estimated the entire industry spent on professional detailing in 2012. On the DTC side, the Top 20 spent $3.2 Bn, which is about 85% of the total of the $3.8 Bn total 2013 DTC spend according to Nielsen data. Based on these numbers, it seems fair to say the allocation of the promotional spend — i.e., the portion of the spending pie devoted to each category — of the Top 20 spenders is representative of the industry as a whole. Pharma, Physicians, and Sermo: A Social Media Win-Win-Win! This article provides an overview of Sermo’s new Client Center and summarizes a Pharma Marketing Talk podcast interview of with Daniel Palestrant, Sermo’s Founder and Chief Executive Officer. In this guest article, Carla Stratfold, CEO at OnRequest Images, presents several key learnings and best practices that pharmas can follow when building brand and consumer loyalty. This article summarizes the aggregate findings of the Rate Your Social Media Marketing Readiness survey and presents the average scores against which you can compare your own score. This article, written by health communications veteran, Harry Sweeney, is a frank assessment of the pharmaceutical industy’s plodding approach to e-communication and e-marketing based on a review of a recent industry conference. This article reviews the Who, What, and Why of Pharma’s Social Media Working Group (SMWG) based on a conversation with Mark Gaydos, Senior Director, U.S. Regulatory Affairs Marketed Products at sanofi-aventis, and Cynthia Phillips, Sr Dir Labeling and Promotional Compliance at Millennium Pharmaceuticals. Also covered is an analysis of comments the SMWG submitted to the FDA on how pharmaceutical companies should handle off-label and adverse event posts made on social media sites owned or sponsored by them. This article provides highlights from submissions by Novartis, Shire, the Pharmaceutical Research and Manufacturers of America (PhRMA), which represents the country’s leading pharmaceutical research and biotechnology companies, the Biotechnology Industry Organization (BIO), Klick Health, the Social Media Compliance Council (SMCC), the Coalition for Healthcare Communication (CHC), and the Digital Health Coalition (DHC), and other interested parties. More and more pharmaceutical company employees are using Twitter. Pharmaguy is looking at pharma employees who have personal Twitter accounts, how they use these accounts, who follows them and whom they follow, and how influential they are. This article is an introduction to the first round of members of this group. Access Full Article Here – PLUS the latest SlideShare version! The long-awaited social media guidance from the FDA — whenever it arrives — may turn out to be nothing more than a stamp of approval on activities in which the industry is currently engaged. Practically every issue that FDA guidance is expected to address has already been handled independently by a few pioneering pharmaceutical companies. Rather than waiting for FDA’s anti climatic guidelines, Pharmaguy decided to publish The Pharmaguy Social Media Timeline™ now, at a time when the industry already has set precedents in every social media application. From the Audition in the Press to TV, Web, and Print Advertising. Pfizer and Amgen demonstrate how to launch a branded spokesperson campaign starting from a bit of over-the-top unregulated press relations to fully regulated TV, print, and Web advertising. It must be costing a mint! This article highlights results of a survey of physician members of DocCheck, a leading European physician online social network and portal site. The survey assessed the type of networks used, the frequency of posting, motivation for posting, estimation of network usage, relevance of content posted and an evaluation of the importance of online physician-generated content in the future. This article summaries research data exploring why physicians interested in using online peer-to-peer social communities outnumber by 2 to 1 physicians who are actually using them. Includes suggestions for what these communities must do in order to provide more value to physicians. Should a PR firm or an interactive marketing agency be in charge of pharma social media campaigns? eDrugSearch has expanded its mission by unveiling its own Health 2.0 venture: the eDrugSearch.com Community, which is a new social network for prescription drug consumers. The eDrugSearch.com Community hopes to help members make choices that save them money, and keep them safe, when buying drugs online. This articles reviews some of the features of this new Health 2.0 Web site. Pharmaceutical companies can effectively implement e-marketing programs through strategic planning and by simply augmenting their traditional sales force, suggests Devin Paullin, vice president of operations at Physicians Interactive. Paullin outlines a 12-month strategy in which firms can proactively target physicians using electronic tools, or e-tools. He recommends that firms use traditional promotion solutions and modify those solutions using e-initiatives. Strengthened pharmaceutical branding and increased utilization of online marketing tools can have a significant impact on the revenue and market value of pharmaceutical firms, according to a presentation by Bill Trombetta, professor of pharmaceutical strategy and marketing at The Erivan K. Haub School of Business at St. Joseph’s University. With all the bad press recently about marketing directly to consumers and privacy concerns, perhaps it is time for the pharmaceutical industry to self-regulate marketing to consumers as well, especially via the Internet. What is the attitude of pharmaceutical professionals regarding the quality of pharma-sponsored health information on the Net? Does the industry perceive a problem in this area? To help answer this question, an online survey – Quality of Pharma-Sponsored Health Information on the Internet – was performed during the month of January, 2003. The results are summarized in this article. Arnold Friede, counsel to the law firm McDermott Will & Emery LLP, and former Senior Counsel at Pfizer, believes that there is an opportunity now to make a strong and compelling argument for the adoption of rational regulatory policies by the FDA that address the unique features not only of sponsored links, but of other kinds of new communication tools, such as social media. In a keynote address at a recent ePharma Summit conference held in Philadelphia, PA, Kevin Hutchinson, CEO and President of SureScripts, a company founded by the National Association of Chain Drug Stores (NACDS) and the National Community Pharmacists Association, looked at the changing landscape and inevitability of electronic prescribing (ePrescribing or eRx) and the implications and opportunities for the pharmaceutical industry. This article discusses the potential pitfalls, regulatory issues, and best practices regarding the use of real patient testimonials based on comments collected from a recent survey of readers and other experts. Pharma marketers save a bundle repurposing videos for Youtube. They save even more money by hiring real patients to play themselves in these videos! Patients are natural method actors, having actually experienced what they portray. But they are prone to over emote! Sowing Seeds of Social Media Change? This article summarizes key presentations made at the April 21, 2009, Social Pharmer ‘unconference’ where leading pahram social media proponents presnted ideas on how the industry can overcome the barriers. This article summarizes different aspects of this latest innovation in portability and performance and how they could be used to increase sales force effectiveness in both the primary care and hospital-based environments. Steve Woodruff, Founder and Principal Consultant of Impactiviti, and John Mack team up to review eyeforpharmas Sales Effectiveness conference, which was co-located with the eCommunication & Online Marketing Conference. In this article, Julie Batten, eMarketing Manager at Klick Pharma discusses pharma’s options for search marketing in this period between the FDA public hearing and when the much anticipated draft and final guidance on the issue is published. Searching for Answers on Search Engine Marketing? Yahoo’s record earnings and Google’s IPO announcement are hot financial stories, but they also herald an important trend that is changing the way marketers think about the interactive channel. Search Engine Marketing, also known as SEM or Search, is one of the fastest-growing e-marketing strategies today. The author covers SEM techniques such as Paid Search, Paid Inclusion, and Natural Search, and suggests that to stay ahead, companies must develop sophisticated content strategies to win the war of visibility. At the Social Communications in Healthcare conference hosted by the Business Development Institute in NYC on July 23, 2009, there were so many people live Tweeting the case study presentations that it’s hardly worth the effort to summarize these presentations after the fact. You can find a good summary–if only in dozens of 140-character packets–on Twitter. This article reviews the results of Pharma Marketing News’ ‘What’s Your Social Media Implementation Plan?’ survey and announces the details of the Pharmaguy Social Media Pioneer Award. PR people are used to issuing press releases to a few journalists at the top of the traditional news pyramid. When the top was blown off by the social media revolution, these professionals had no proven mechanism by which to reach the many thousands of bloggers at the BOTTOM of the pyramid — until now. This article presents ideas for regulatory ‘safe harbors’ under which pharmaceutical companies would be relieved of the responsibility of monitoring social media for adverse events. Includes a detailed summary of responses to the survey ‘FDA Regulation of Drug & Device Promotion via the Internet & Social Media’ regarding social media adverse event monitoring, processing, challenges, and uncertainties. How Ready is Pharma to Engage In Social Media? This article summarizes the recent Digital Pharma Europe congress where it was the time right to see that European pharma marketers are also interested in new/social/digital media in pharma, but may be more constrained by regulators than their brethern in the US. Many presenters at FDA’s November 2009 public hearing on the Promotion of Food and Drug Administration-Regulated Medical Products Using the Internet and Social Media Tools addressed this problem and offered solutions. Comments submitted to the FDA after the meeting offer more details, which are reviewed in this article. This article summarizes some major points made in that presentation as well as data from the report “Patient Apps for Improved Healthcare: From Novelty to Mainstream” published by IMS Institute for Healthcare Informatics. FDA’s “Guidance for Industry Fulfilling Regulatory Requirements for Postmarketing Submissions of Interactive Promotional Media for Prescription Human and Animal Drugs and Biologics” has left many questions unanswered. Proving deep interest in the topic, more than 400 people attended the “Green light or go slow: What FDA’s new draft guidance means for social media in pharma” webcast on March 13, 2014 during which over 40 questions were asked. This article focuses on a few of the issues, gray areas, and questions mentioned during this webcast and also in comments submitted to the FDA. Although nearly two-thirds of respondents to a 2009/2010 Pharma Marketing News survey thought that using Twitter for patient support activities would be somewhat or very effective, relatively few pharmaceutical companies are doing this on a regular basis. From time to time, however, it does happen. This is a summary of a recent presentation by David L. Stern, Vice President of Marketing for Metabolic and Endocrinology at Serono, Inc. Stern spoke from a marketer’s perspective about recent trends in the pharmaceutical industry and how to address them by developing better marketing programs. Welcome to Pharma Social Marketers Anonymous (PSMA)! You are among friends. Soon, you will take important steps on the path to overcoming your fear of social media. The first step is to admit you are powerless over social media and that your online life has become unmanageable. Are you ready to take ALL 12 steps toward recovery? Although many pharmaceutical companies actively use Twitter and other social media tools to push out positive news about their companies and products, very few use these tools for systematic support of patients who depend upon their drugs, which may be short supply. This article summarizes the results of a survey designed to answer the questions: Should the pharmaceutical industry adopt similar self-regulatory principles that were established by media and marketing trade associations to protect consumer privacy when employing behavioral targeting, Should pharma marketers use behavioral targeting at all?, If they do use it, when is it appropriate? This article is a summary of the EPG Health Media (part of the IMR International Group) market research report ‘Social Media and Healthcare,’ which examines how European doctors, patients/consumers and pharma engage (and seek to engage) with each other. Should Pharma Fill the HCP-to-Patient Social Media Vacuum? Twitter has often been hyped as a great way to support customers. The customers of pharma are physicians and patients. But pharma Twitter accounts offer very little in terms of patient support. This article summarizes a survey that asked respondents to evaluate several ways in which Twitter could be used to improve patient support. The View From ePharma Summit: Practicing What Was Being Preached! This article is a compilation of summaries of presentations made at the 2009 ePharma Summit. Included are highlights posted to the ePharma Summit and other blogs during the conference and insights on epharma marketing issues provided by several conference speakers and attendees. A growing number of doctors prefer digital communications and the pharmaceutical industry is currently in the process of moving its sales force to a smaller structure that is more directly aligned with this new reality. One aspect of that change is the deployment of “virtual” sales reps. This article presents a Wockhardt USA case, which employed the vRep virtual sales rep platform. Pharmaceutical marketers are having a field day pushing the envelope on the Internet and especially in the social networking, Web 2.0 arena — the new WILD, WILD WEST of the Internet. Many, however, are getting caught trying to perform the ‘tricks of the trade.’ With just a little bit of guidance and tips from the masters, you can perform these tricks WITHOUT getting caught! Disease management is a complex process for pharmaceutical manufacturers, but Internet-based programs can help drive market share, sales growth, and patient compliance. Cedric Tuck-Sherman, director of eBusiness for Baxter BioScience, discussed his company’s experience with creating and managing a web-based therapy management program for chronic diseases during a recent Patient Persistence, Compliance and Education seminar sponsored by EyeforPharma. What If There Were No Rules in Pharma Marketing? What If There Were No Rules in Pharma Marketing? There’s no FDA, no DDMAC, no FTC. Your company guidelines and rules don’t exist and your regulatory and legal teams have been disbanded. It’s a free-for-all and there are no rules. The question is: what would you do? Although the CAN-SPAM law is often portrayed as a white knight that will save us from dastardly e-mail spammers and pornographers, many of its provisions cover all commercial e-mail, even permission-based, opt-in e-mail. It is also applicable to B2B e-mail communications and one-to-one commercial e-mail messages such as e-mail from sales representatives to physicians. “Just when we are overrun with the need for content & media strategies of every type from search to email to website to video to social to mobile, now we have the opportunity to contemplate an infographics strategy,” said Craig DeLarge, former Director, Healthcare Professional Relationship Marketing at Novo Nordisk. Infographics have found a home on Pinterest, a content sharing, social media service that allows members to ‘pin’ images, videos and other objects to thematic pin boards. Who Owns Your Social Media? Twitter’s new rules change the playing field for third party developers, establish caps on number of users, and shift guidelines to requirements across four categories of businesses. Will the new rules ruin the spirit of social media and are they bad for healthcare? This article reviews a presentation by Elizabeth W. Boehm, Forrester Research Analyst in which she presented multiple data sets, including results from Forrester’s Technographics Benchmark Study and eDetailing Survey. Every year Pharmaguy reviews the images that appeared on Pharma Marketing Blog and picks his favorites. After all, a picture is worth a thousand words! But rather than just presenting images out of context, Pharmaguy presents the images WITH context and comments, plus links, should you care to delve deeper. Highlights from a Pharma Roundtable discussion and comments from several bloggers in the Pharma Blogosphere about pharma use of social media.